Best bicep exercises with instructions. This page covers the most effective exercises for bicep development, including instructions on how to do the movements properly. Best bicep workout for strong developed arms. Free weight lifting exercises for strong biceps. Step 1. In a standing position, with your feet and hands about shoulder width apart, grab onto the barbell using an underhand grip. Step 2. Begin to lift the barbell with your elbows tucked to the side.. Move the weight all the way up and flex the bicep at the top of the movement. Step 3. Slowly lower the weight using only the bicep to do the movement. You should only feel it in your bicep. Use slow controlled form to make this an effective bicep workout. Dumbbell exercises for huge biceps. Step 1. 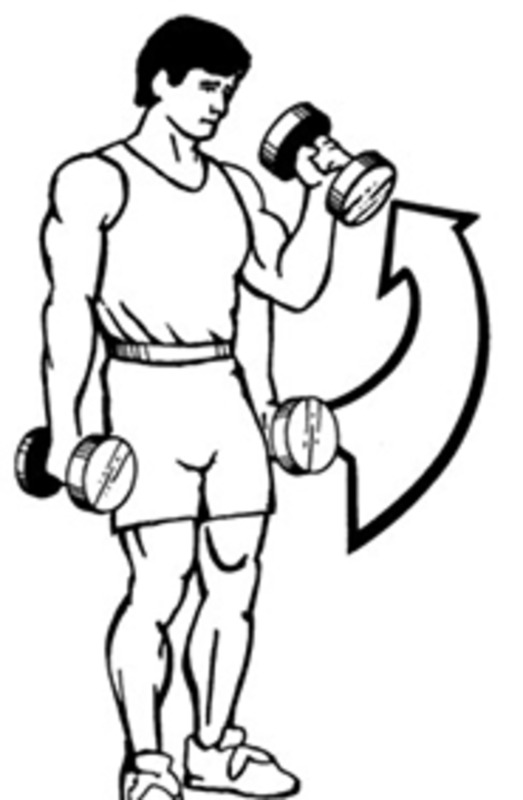 At arms length, hold the dumbbells to both sides of your body, palms facing towards you. Step 2. Begin to lift one dumbbell up across the front of your body, twisting the wrist, so that the palm of your hands are facing your torso. Contract the bicep fully at the top of this movement. Step 3. Proceed to lower the weight while simultaneously bringing up the second arm, crossing the path of the other dumbbell directly in front of the body. Both dumbbells should both cross each others path in front of the body, to insure a continuous, steady motion. Step 1. Same as alternate dumbbell curl, but make sure you bring the weight up with the thumbs pointing toward the face, throughout the entire movement- No twisting of the wrist involved. Step 1. Lay down on a flat bench, and hold a moderate weight to both sides of your body. Step 2. Lower the weight slowly, palms facing ceiling. Step 3. Stop the movement just before the arm is fully extended, to keep full stress on the bicep. Step 4. Bring the weight back up, until the biceps are fully contracted. Be sure to fully squeeze at the top. You can do these standing up, using a dumbbell, one arm at a time, and using an incline bench. Step 1. Position your elbow on an incline. Position the bench one notch higher than what you would do for an incline bench press. Leverage yourself by putting one leg on front of the other. If the left leg is in front, then curl with the left arm as well. Same goes for the right side. Step 2. Lower the weight slowly, and put a lot of concentration on the bicep. Stop the movement just before the dumbbell touches the bench. Step 3. Bring the weight back up, and squeeze at the top. This movement is ideal for those wanting to add height to their bicep muscle. This is a great bicep workout! From: Bicep Workout. Back To: Weight Lifting Exercises.